Don't you leave Barcelona without posing next to Ronaldinho Gaucho, winner of so many awards with FC Barcelona, Brazilian soccer virtuoso, featured in so many TV spots, video games, and even in cartoons. Look at this lucky tourist side by side with her idol, isn't she plethoric?...Yes, I know, shame on me. How do I dare! Don't tell me there is no resemblance though. Sorry Ronnie, just joking. Care for a link, here it is Ronaldinho Gaucho Official Web Site. 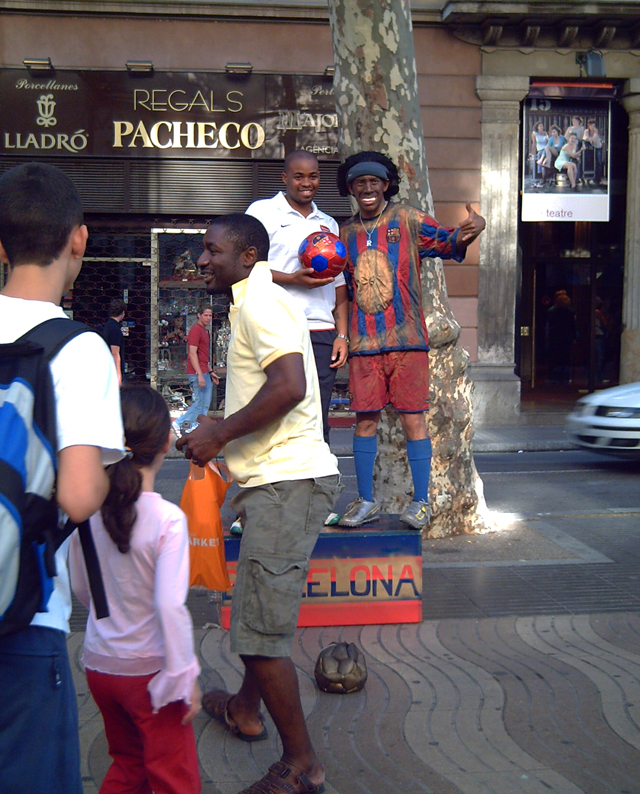 See this other picture of the artist impersonating Ronaldinho. It took him a lot to smile, wearing such big false teeth, but he was funny saluting the surfer's way. Recomended: Search for Ronaldinho's Bio or anything related to him and Barcelona FC in my FCBarcelona swicki. Now a different suggestion: Visit Digital Photography School, for tips and lessons. just brilliant carlos! what does he do? does he pose like the other human statues or does he move about? These pictures from Las Ramblas are quite amusing Carlos, I'd love to be able to visit again some day! Visca! visca el Barça i visca Ronaldinho.